Choose a sanitary bin to suit your business – not your supplier! First decide on the service you need! Before I get down to talking about actual sanitary bin design, let me explain that there are two types of sanitary bin service: the bin replacement service or the liner exchange service. A bin exchange physically removes the bin from the premises every time and replaces it with another (clean?) bin. This works fine in offices and industrial sites. In theory it should work fine in all buildings but would you want a service company carting a dozen sanitary bins through your restaurant or hotel lobby especially at during busy times (periods doesn’t seem an appropriate word in this context). A Liner exchange on the other hand removes the waste from the bin and it is placed in a modesty bag which is discretely removed from the premises. The bin should be cleaned and sanitised on site which means that you are guaranteed not to get a cigarette burnt old scabby bin left in place of the shiny new one you had on installation. Most service companies that do provide a liner exchange service either use a scented antimicrobial liner which inhibits smells or use a silicate powder or sachet to do the same job. The bin exchange companies tend to do neither. At this point it is pretty irrelevant which bin style you choose as most bins (90%) of those on the market can be either bin or liner exchange. Is there such a thing as a ‘designer’ sanitary bin? Well Versace haven’t launched one yet (that I am aware of), but yes, you can get various designs dependent on your business needs. 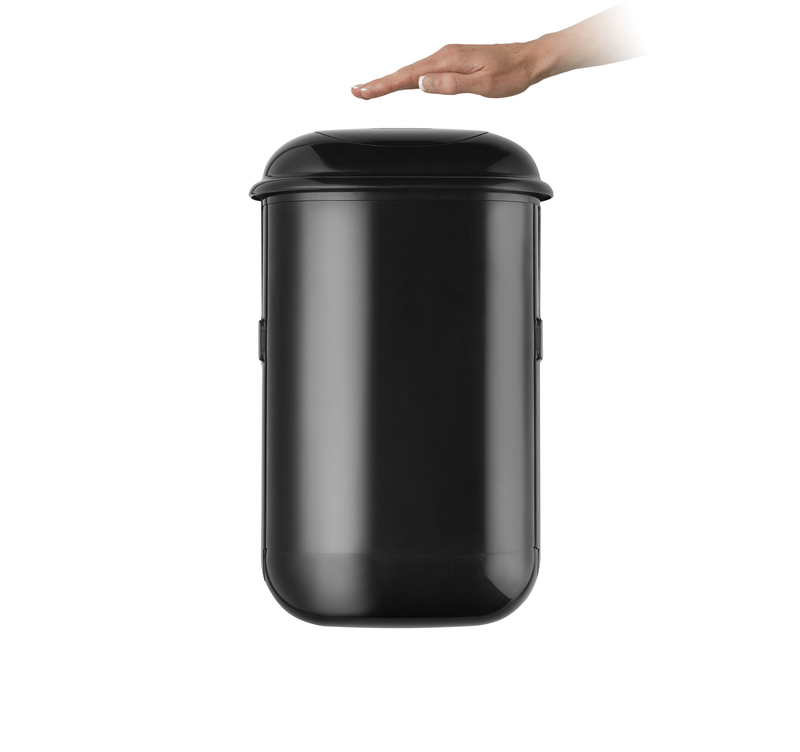 The standard bin is a grey or white unit , but becoming more popular are the ‘green’ bins from Kennedy Hygiene – it is actually grey but made from 100% recycled plastic which does mean that every batch is a slightly different shade but it is certainly a step in the right direction and is no difference in price to a ‘standard’ bin. In the bad old days ‘designer’ bins had their lids dipped in chrome to give a shiny ‘expensive’ finish. However with advances in coating technologies you can have any colour you wish or even a mix and match of colours – of course there is a cost but several suppliers now have an all-black bin which is the current ‘hot’ favourite. Is there a ‘high tech’ designer option. The short answer is yes. Several manufacturers now sell ‘touch free’ or IR sensor bins and you can get them in various finishes. The real star of the ‘high tech’ stakes is the wall mounted Sanipod from Pure Concepts, a New Zealand manufacturer of washroom products that has introduced an infrared bin with an integral liner which means it can be emptied safely everyday drastically reducing any risk of odour issues. It is also wall mounted, one of only two companies (the other being Vendor in the Netherlands) who produce an ‘off the floor model’. So what is best for me? That is where your local washroom service provider will come in. You can search for an IWSA approved supplier here for your area and you should get at least two companies to speak to. The more populated the area you live in, the bigger the choice. However all of the above come at a cost. It should not be surprising that servicing equipment in the washroom is labour and cost intensive, so be very afraid of anyone offering you a great service and a great looking bin for less than £50 per annum. The economics just don’t stack up so the supplier will have to find other ways to get their money. Duty of care note fees – should be free but some companies charge up to £250 annually so be careful and check before you sign. Fuel Surcharge fees – yep some folk try anything. Selling bolt on services after the contract is signed – a classic is installing an air freshener and air purifier, one cancels out the other so you pay double for no effect. Random price increases – the national service providers have a clause in their contracts that basically allows them to increase prices as often and by as much as they want. This tied into a 5 year deal becomes a very expensive option. So the simple sanitary bin is not quite as simple as you first thought and by discounting heavily to get you to sign up to a 5 year deal most national suppliers then employ an army of ‘business development managers’ whose job it is to upsell additional services and generate margin from the original loss leader. 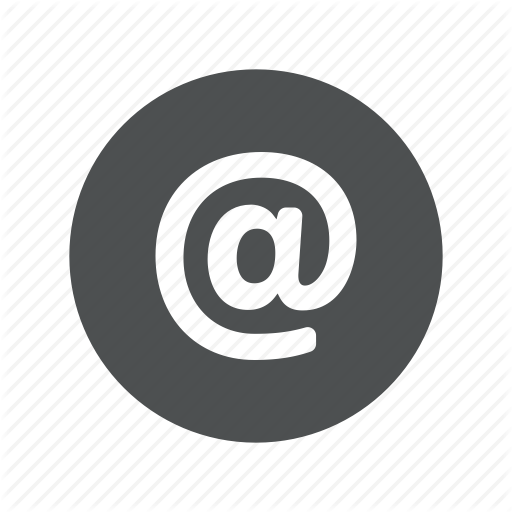 Just a small blog here and really more on the general business side of things rather than the specifics of washrooms – although this was about a washroom service contract. Today I declined the opportunity to secure some business. Am I crazy? I think not. When I started my own business many years ago I would chase every piece of business I could, grateful for the opportunity and the hope that it would turn into something substantial. Some did and some didn’t of course, actually a lot didn’t and it may just be all those little alarm bells from bad decisions over the years that made me say no thanks. I am going to explain this one a little more and if you have any comments then I will be glad to hear them. The initial enquiry was to provide a sanitary bin service in a new office for a UK company setting up an office in Scotland. It might seem strange that if they have offices across the UK they haven’t asked their incumbent to supply, but they might like to use local suppliers so a quote was issued in good faith. On acceptance of the quote a 5 page supplier approval document was sent to us which included such info as 3 years accounts, amount of staff, staff turnover, rates of pay of staff and sub-contractors as well as the usual public and employers insurance requests and RAMS (Risk Assessment and Method Statements) they even asked for environmental and equal opportunity policies. Very few customers ask to see our insurance documents – mostly large corporates or public bodies. 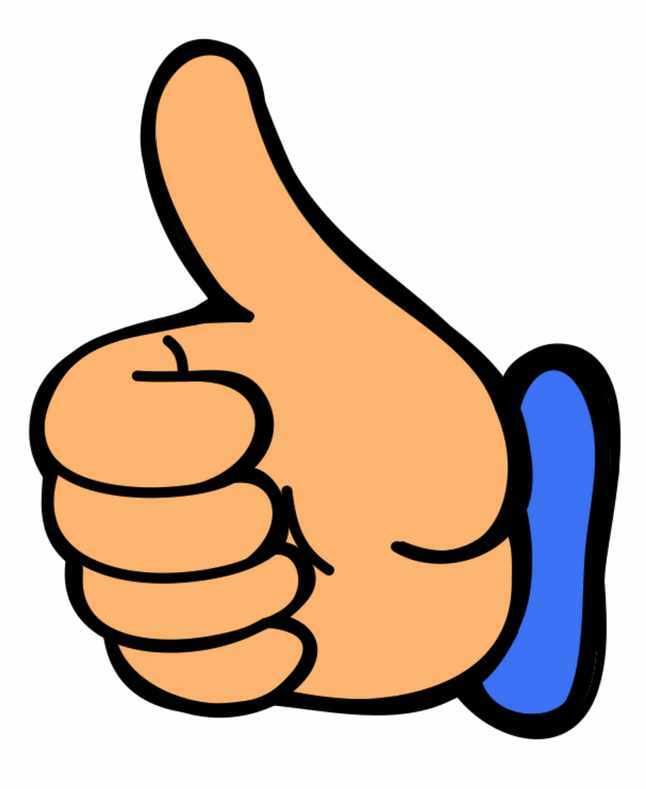 Most companies appreciate that we as IWSA, SMDSA, British Safety Council members or associate members must be reasonably good at what we do, that and the list of corporate clients that scream ‘QUALITY SERVICE!’. For large tenders and contracts we will of course provide audited accounts as part of a PQQ, no bother. But to install and service a solitary sanitary bin with an annual value of less than £100. It seemed a bit excessive and I made a decision that as a business we had more pressing matters than taking an hour or two to secure the contract. Let me add that the hour or two is probably the margin in that piece of business. Furthermore as we do not tie our clients into long term contracts and the fact this potential client had no loyalty to her incumbent supplier could there be a pot of gold at the end of the rainbow? Probably not. The strange thing was in all the documentation that was asked for the one thing that wasn’t requested was a copy of our waste carriers licence. Occasionally we get asked for proof of our waste carriers’ licence which we provide to every customer as part of the Duty of Care note. So I am going to pop this into hyperspace and see if you agree or disagree. Please feel free to share, discuss or call me a fool. Which is a fair point, as I love to cut my own hair, change the brake pads on my car as well as process my own Kebab meat and bake my own bread – you get the point. 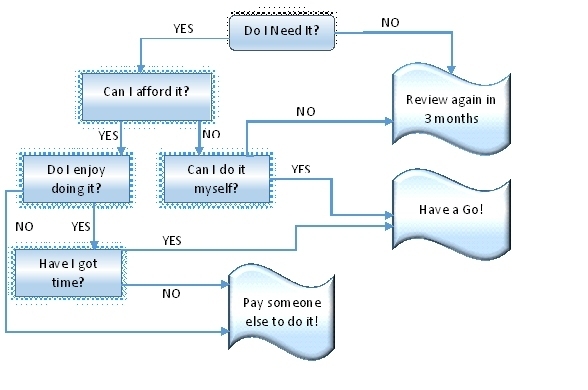 As a business owner I regularly have to use the following flow chart. It applies as much to washroom services as it does to any product or service your business might need. Let me look at some of these questions from a Washroom perspective. The real answer is dependent on how your local EHO interprets the legislation and guidance. The guidelines that we tend to work with is whether, as a business, you generate more than 25Kg of ‘offensive’ waste over a 12 month period. Some authorities use a % of waste: for example if the offensive waste that your business generates is more than 10% of your total generated waste, it must be separated from the general waste stream and disposed of by a registered carrier. This is certainly the case with Care Homes, children’s nurseries, indoor play centres, family venues, motorway service stations, doctor’s surgeries, dental practices, some beauty therapy centres, etc. However a greater risk for many small businesses, especially cafes, restaurants and bars is sanitary waste being flushed down the toilet because of a lack of an appropriate means of disposal. This can cause blockages and one call out from a plumber is a lot more expensive than a single sanitary bin installed onsite. For example our sanitary bin service starts as low as £75 per year depending on location, number of units, service frequency (13 visits included at this price)and type of bin that you are after (Click here to get a quote). In comparison to a plumber or emergency drain clearage charge it’s a pretty low cost – £1.44 a week approx. I suspect most businesses can. 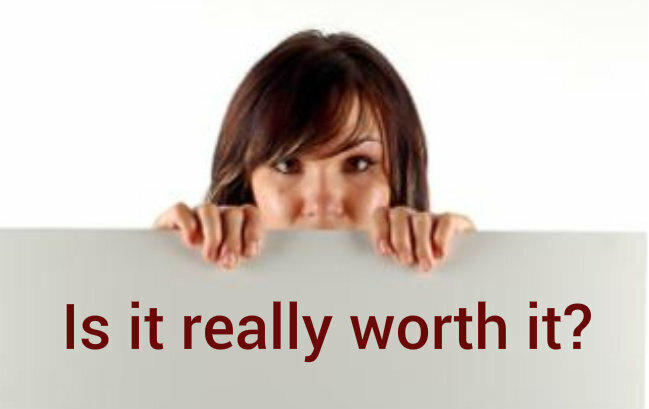 However larger businesses can offset the cost if they think a little out of the box. Every business needs to buy toilet paper and soap and either buy hand towels, launder linen towels or buy/rent a hand dryer. By sourcing these products from your local washroom company there could be considerable time and money savings which invariably would cover the cost of a sanitary bin. If you have urinals at your business, the installation of a water management system could save £100’s if not £1000’s of pounds which again could offset any washroom costs. It’s another great reason to go to a local supplier who will not only rely heavily on referrals but also their reputation within the local business community. A quote is free and if you are unsure, have a look at my washroom services company guide for an alternative opinion. If we were discussing telesales, social media, delivering orders, cold calling, etc. I am sure there are aspects of every business that some of us enjoy enthusiastically (I actually enjoy blogging more than servicing sanitary bins believe it or not). I have yet to find any company that likes or has staff that like dealing with emptying the sanitary bins or cleaning the urinals for that matter. So why not source out something you don’t enjoy doing to someone who is paid and trained to do it? If you are a small business then you may be able to do it yourself. The issue with most businesses is that they invariably run out of something, soap, toilet paper, and then end up buying ‘emergency’ supplies from the local supermarket. A pump action liquid soap is maybe 3 or 4 times more expensive than a wall mounted foaming soap unit and a foaming soap unit will last 10 times longer which means you will run out less often. Have I got the time? If your business is like mine the one thing you don’t have in abundance is time. Time poor is a common complaint of most business owners. But if you do have the time and don’t have the money – crack on. If you have the time but maybe not the money at the moment, stick a note in your diary to review the situation in 3 months’ time. Then get a couple of local businesses competing for your business. Trust me, the simplest of service options won’t cost the earth. There you have it. 5 questions you should ask yourself probably for any service or product your business requires but especially for washrooms. Spring has come at last. Greenkeepers across the land will be rolling the greens, clearing the twigs out of the bunkers and spreading the fertilizer/weedkiller across the fairways. Golf Clubs, like many seasonal business will be starting to see their visitor numbers rise, and so clubs across the land should be looking to replace the broken hand dryer, dripping tap or other piece of equipment which has not been quite as important over the winter when ‘just’ the members are using the club. 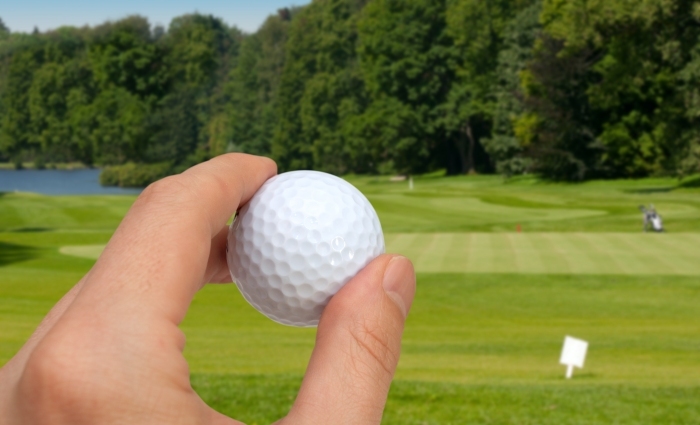 Why the interest in Golf Clubs? Well, as a golfer, I see these issues at my club not just this year but last year too, and try as I might to save them a few pounds they really aren’t interested as there are always more important stuff to do during the winter and by spring it’s often too late to plan properly so quick fixes are sought. Recently I saw a vending machine that was still dispensing products for 20p. The average item in a washroom vending machine costs 60-70p so that gives you some idea how long that piece of equipment has been on the wall. In my estimation 25 years plus. All the national washroom service companies will put their prices up at least once a year. If you read the small print, which I am sure all my readers do, you will see that the wording is along the lines of ‘can increase the price at any time without notice’. The issue here is that these letters are sent into Clubs and associations who accept it as the committee may be completely different from the previous year and although they will get round to it is the start of the busy season and they will look into it in November. So whether you are a Golf Club, Social Club or other type of members club, please don’t keep putting if off or burying your head in the bunker. Get your contract out and you may get your whole washroom upgraded for less than you currently are paying for shoddy equipment. 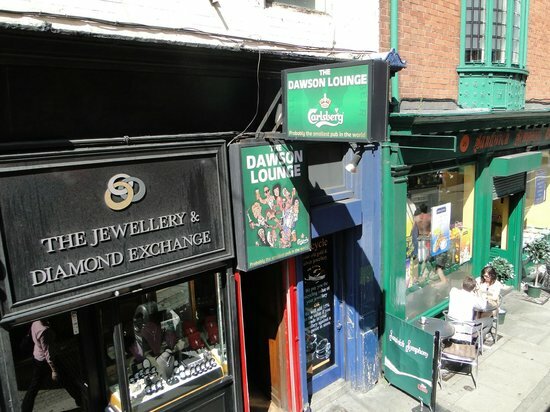 Recently I was in the smallest bar in Dublin. Although the bar was tiny, the toilets were reasonably sized. But not every business has the luxury of large spaces for toilets and in many cases one toilet will be used by all staff and customers alike. So what can be done to make a small toilet look ‘professional’? Make sure there is a sign on the door many small businesses just don’t bother! Get rid of any carpets or mats around the toilet. These are only (just) acceptable in a domestic environment but not in a professional one. Install a sanitary bin: these can be fitted in the smallest of toilets and will reduce embarrassment and prevent blockages. Try to get consistency in the dispensers having a matching soap, toilet roll and paper towel dispenser. Do not use linen (domestic) towels. Use paper and have a waste paper bin in the toilet or alternatively install a hand dryer. Use a cleaning product that has a light fragrance (not bleach or pine disinfectant) heavy fragrance gives the impression you are masking smells as opposed to a ‘clean’ smell. Clean the toilet, sink and surfaces EVERY day. Use an air freshener that reflects your business. A hotel or guest house may use a fresh linen for example. It is safe to say that all businesses are reflected by their toilets from 5 star hotels to the smallest accountancy office. The impression you give visitors is important and great toilets can make or break a decision on whether to recommend or indeed come back for another visit. Helping Autistic children and their families with toilet hand dryers. I was invited down to the official launch of the Caudwell International Children’s Centre (CICC) which was at the House of Lords. The centre is being funded by Caudwell Children, a charity set up by mobile phone entrepreneur John Caudwell. The building, which is now watertight and due to be completed in August, will be the UK’s first purpose-built centre for multi-disciplinary therapy programmes for childhood disability and research of neurodevelopmental conditions including autism. The total cost will be in the region of £18million pounds and is being constructed on the Keele University Campus. It is estimated that 170,000 children in the UK have autism and that there are as many as 279million children worldwide with the condition. Yet only £4m a year is spent on autism research compared to £590m spent on cancer research and £169m spent on heart disease research even though autism costs the UK taxpayer £32billion per year (cancer costs the UK taxpayer £15b per annum). So there is a real need to complete this research. One of the areas that the new centre has struggled with is hand dryers. They have had a major dilemma: firstly whether to install hand dryers and secondly to find a dryer that would be beneficial in helping autistic children cope when taking part in family activities away from home. As part of the development team for Puff the Magic Dryer, I have been involved in the needs of the centre and how we can support the children and staff in the key area of toilets and washrooms. It is early days yet but let’s hope that centre can make a huge difference to not only children suffering with autism but also the families of those children. I will keep you updated as the centre nears completion. Should we pay for public toilets? I have already written several times about public toilets and the provision of them. Whilst in Auchterarder today I thought I would pop in and have a look. Yes the place is a bit dated but overall the toilets were clean and had a pleasant fragrance. There was paper towels available and two (very old) hand dryers. Were the facilities ‘world class’? Not really, were they worth the 30p entrance fee? Well if I was desperate I am sure that I would have happily paid. 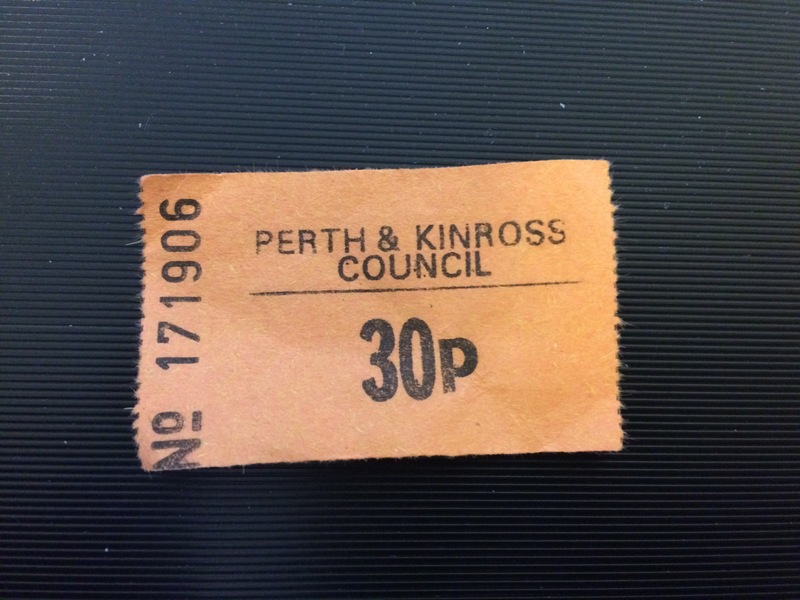 Did the 30p cover the wages of the attendant sitting in the booth and handing me and little orange ticket? Probably not. So here is a thought, especially for Perth and Kinross Council but appropriate for most councils. Why not remove the need for a permanent attendant and implement an honesty box? Yes, have someone to open and close the toilets as well as clean, check and restock but why not let the public pay what they see fit. Maybe I am too generous in my opinion of people but I think that many folk would pay a little more if the place is clean, tidy and smells pleasant. Any money made could be reinvested in things such as decent hand dryers and heaters as well as maintenance and repairs. Having great public toilets is essential. Scotland has a massive tourist industry and providing easily accessible and well maintained public toilets go a long way to supporting that industry. An added bonus is that many smaller businesses locally enjoy additional footfall when a weary traveller decides to take a break. Self Cleaning Toilets will be here sooner than you think. Self cleaning toilets – the future or just another daft idea? Hydrophobic is a word associated with Rabies. It describes the being that has the disease/infection’s symptoms – a fear of water. It is also being used to describe a coating process that is currently being used in mobile phone technology but soon could be coming to a washroom near you with Self Cleaning Toilets. There are several variants of the technology, the main one being a two coat process – a base coat that ensures that the topcoat sticks to the surface. Once the product is applied it will not allow anything with water in it to stick to the surface. Think on that – nothing would stick to the toilet or sink surface. No more toothpaste marks, water marks or worse. But is this too good to be true and what is the downside? Well, first of all the systems I have looked at leave a dull matt finish which may not suit many businesses. I am sure there will be a gloss version somewhere; I have just yet to find it. The second question is, and this may sound silly, will toilet or washroom cleaners remove the coating if they have to be used? Do you have to have a chemical free zone? And in the domestic situation, will the product survive shampoo, hair dye and other products that are the opposite of hydrophobic? It’s a thought and right now I would be keen to hear your views on this potential development. Would you feel comfortable using a public toilet that hadn’t been cleaned in the traditional way? With the removal of the need to clean the actual toilet, would the surrounding area cleanliness suffer? Are you being deafened in the Washroom? Hand dryer manufacturers are as guilty over noise levels as car manufacturers are on diesel emissions. Humans are born with only two fears, a fear of falling and loud noises. Natural defenses built into our DNA from before we humans walked on two legs probably. For those of you not familiar with how noise levels are recorded here goes. If sound over a level of 70 decibels has just a small increase in the scale of +3 decibels (dB) this has double the noise impact. 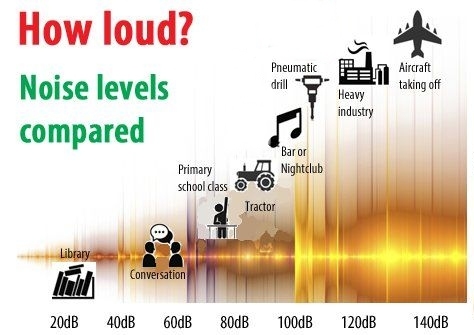 So 73dB is twice as noisy as 70dB. 76dB is twice as loud as 73 and so on. With regard to hand dryers, some manufacturers put noise levels on their equipment like a badge of honour “only 95dB”. Some manufacturers, like a good car salesman, have more refined tricks “30% quieter than our best-selling model” which sound amazing but that does not mean that the noise level has dropped from 95dB to 66dB more likely to have dropped from 95db to 94db. This is not the only trick in the book. Noise levels should always be taken 1m from the source, but unless you have arms like an orangutan you will probably be closer than 50cm, even closer if you are under the age of 10? So if noise concerns you download a noise meter app to your phone, and see what the results are. Another reason that ‘claimed’ noise levels are actually much higher is that the noise is measured before hands are put into the air flow. The faster the airflow the more impactful the noise level. So newer models of both hands-in and hands-under dryers can force the air out at speeds of 400mph. Manufacturers will try all sorts of tricks to get around this and a bit like diesel emissions in a car, whatever noise level you see you can be assured that the reality is very different. The issue for me with noisy hand dryers, especially in very young children, is that they associate hand washing with something that scares them – noisy hand dryers. Yes, I can hear the cries of “but children need to be exposed to germs and creating compulsive hand washers in the young could cause all sorts of issues in later life”. I agree. But that discussion has to be for another blog. My toilets – and other animals! Whilst completing a site toilet survey of a large stadium the other week , I came across a dead rat floating in a toilet. 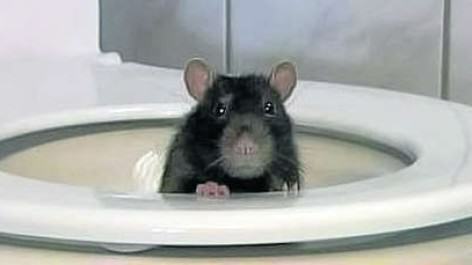 Rats are generally pretty good swimmers and have no issues ‘diving’ through the ‘S’ trap of a toilet bowl as a means of access to a property (another good reason to always put the toilet seat down). The link will take you to a great National Geographic video showing how easy this is. I suspect this poor blighter had been partially caught by a rat trap – i.e. had a trap attached to his tail. Whilst trying to make an escape through the waste pipe, the trap would have got stuck in the bend and the poor mite didn’t make it. Redback (nasty spider with hell of a bite) in a public loo at a beach north of Brisbane. Poor lad, I don’t think he will go to a public toilet for a long time. These two instances got me thinking about the obvious: toilets and animal connections. We had a dog that liked nothing better to have a drink from the toilet bowl. A quick online search will show plenty dogs and cats that have been trained to actually use the toilet (not sure if the animals are clever or the owners have too much time on their hands?). But excusing the invasion of the toilet, other beasties I have personally come across hiding out in a toilet bowl are, of course, spiders and flies. I have also fished a mouse out of a toilet (still unsure how it got there). I must also plead guilty to having to having flushed a (dead) goldfish down the loo in my youth. However my experiences are pretty tame compared to the results of a quick search on the web. Snakes seem to be the most popular ‘wild’ animal – not in the UK obviously. 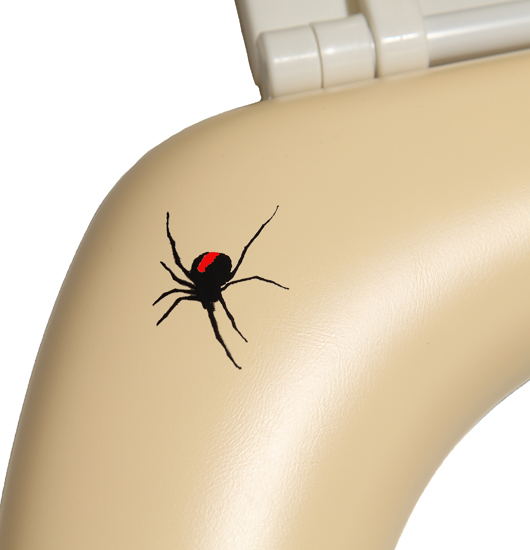 Spiders are a massive issue in Australia and parts of USA especially the ‘bitey’ poisonous ones! Frogs and Toads are common but in the UK it seems to be rats that literally ‘pop up’ the most. So my advice is simple.